Artemis Awakening is the start of a new series by New York Times bestseller Jane Lindskold. The distant world Artemis is a pleasure planet created out of bare rock by a technologically advanced human empire that provided its richest citizens with a veritable Eden to play in. All tech was concealed and the animals (and the humans brought to live there) were bioengineered to help the guests enjoy their stay…but there was always the possibility of danger so that visitors could brag that they had “bested” the environment. The Empire was shattered in a horrific war; centuries later humanity has lost much of the advanced technology and Artemis is a fable told to children. Until young archeologist Griffin Dane finds intriguing hints that send him on a quest to find the lost world. Stranded on Artemis after crashing his ship, he encounters the Huntress Adara and her psych-linked companion, the puma Sand Shadow. Their journey with her will lead Dane to discover the planet’s secrets…and perhaps provide a key to give unimagined power back to mankind. I have a few of Lindskold's titles waiting on the shelf, The Buried Pyramid and Firekeeper Saga among them, but like so many others she's been lingering in the land of 'to-be-read.' Something about this new science fiction series really grabs me, though, and if I can get a hold of an ARC, then I intend to dive right in and get her shifted to the 'read' shelf as soon as possible. On my list as well! 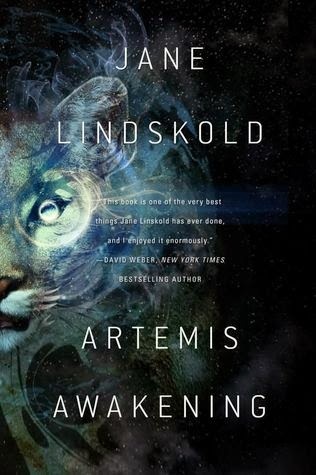 I haven't read anything by Lindskold, but this one caught my eye and I thought I'd like to check it out. Plus, that gorgeous cover. Like the sound of that one. And the cover is cool with the puma. Never even heard of this one, and it is from Tor? I should spend more time browsing catalogs so I know what is coming. oh my, that looks and sounds absolutely intriguing! And what an outstanding cover! This sounds incredible! I just added it to my TBR pile, and while I was doing that I noticed that there is currently a Goodreads First Reads giveaway for this book. I can't wait to read it! Great pick! OOoh that sounds like an epic sort of read! Hope you enjoy it once you read it!